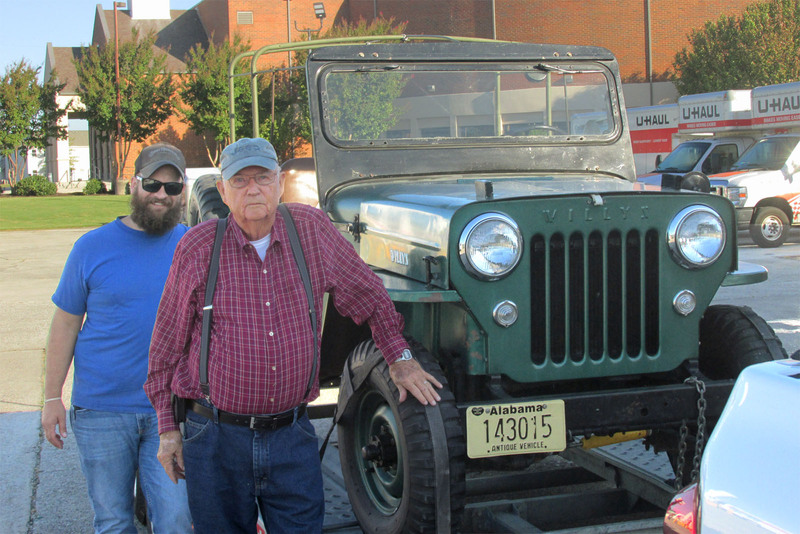 Lawrence got a hand from his grandson Michael Robinson of Nashville, to trailer the Jeep 350 miles, from Decatur over to North Carolina. 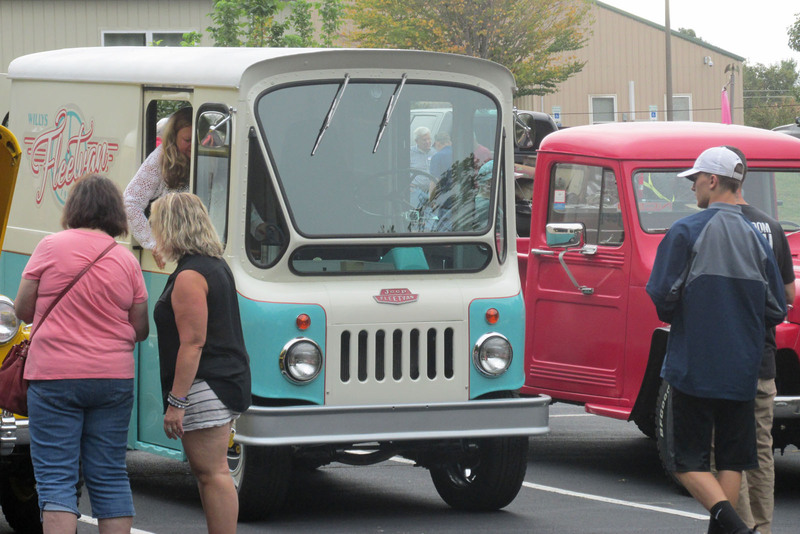 They got to the Grace Arts Center in Mills River, and found that the Station Wagons had already staked out a section of the parking lot. 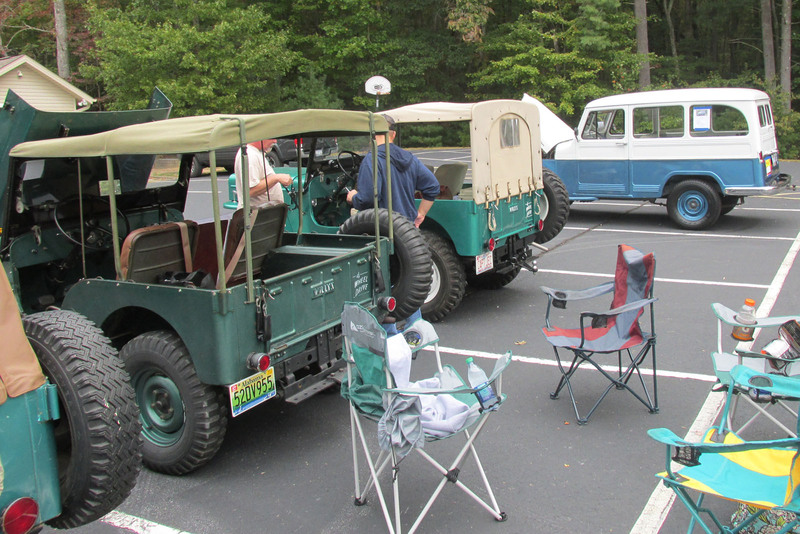 The one on the left is under restoration by Southeast Willys organizer Will Springer -- it was bought new by his father in 1962. The eye-catching yellow wagon is Tyler Tedford's '51. Marshall Parker arrived in his award-winning 1952 M38. 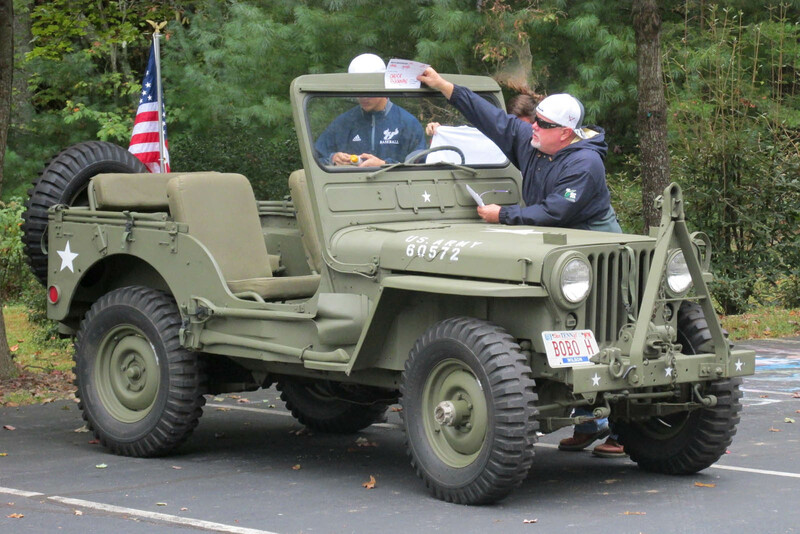 For comparison, Chuck Buckman had his '52 M38 in US Army livery. 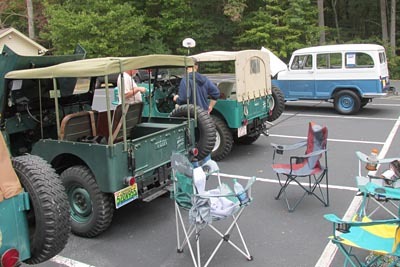 Lawrence and his wife Ora Lee soon had the chairs set up behind their Family Tradition CJ-3B. 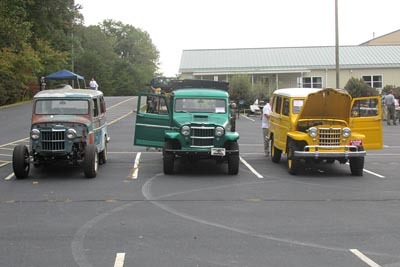 This wagon's owner had grabbed a spot on the end of the row because it was for sale. 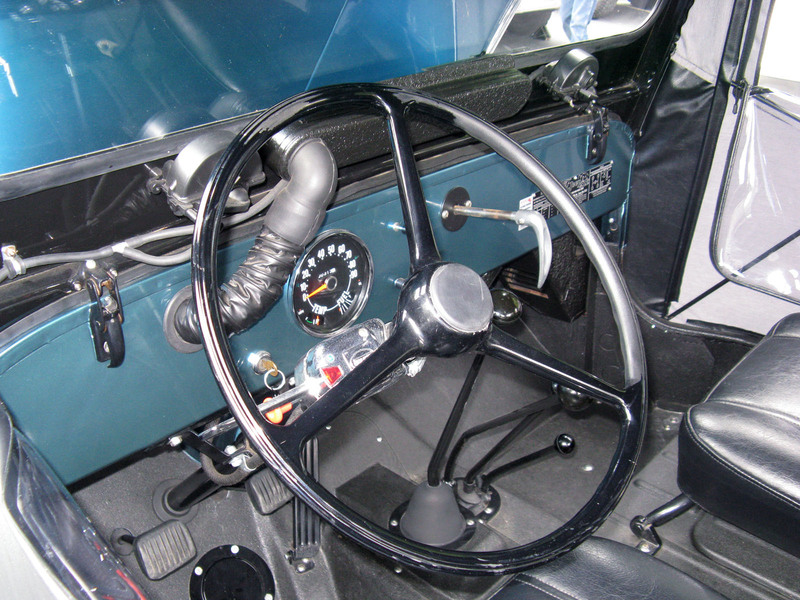 It featured an interesting diamond plate interior. Right next to Lawrence's '55 was Joe Childers with his matching '64. 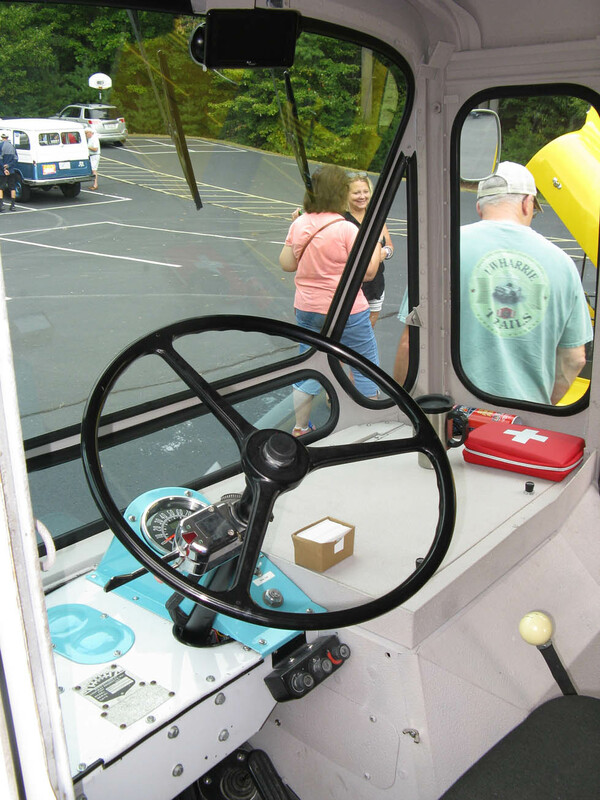 Great to see Joe wearing his CJ3B.info T-shirt! 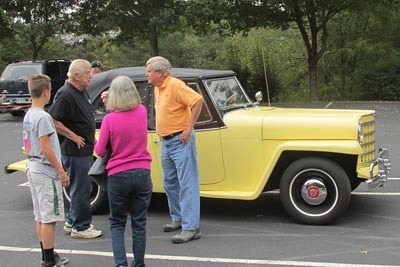 Perched on Lawrence's Jeep in the background is Tiger (170K JPEG) who has been going to car shows with the Wades for many years. 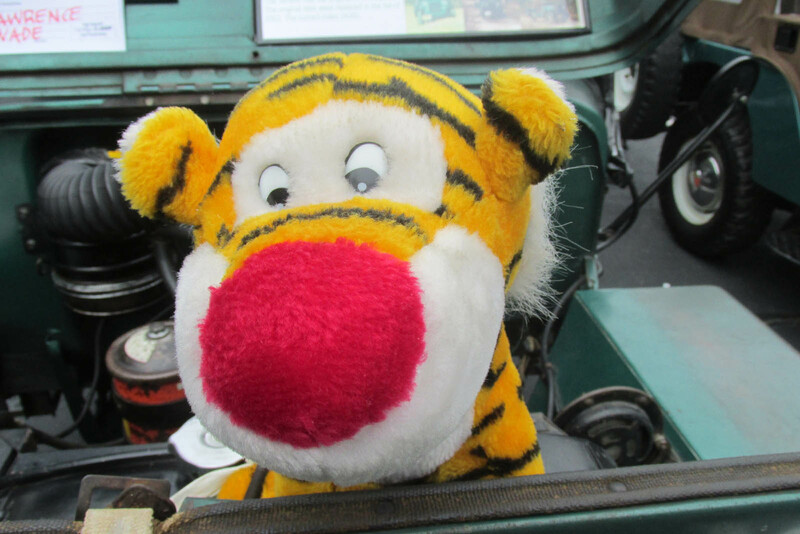 Lawrence says, "I won Tiger from a grab and go vending machine and I told Ora Lee I would like to keep him in the Jeep as good luck omen. 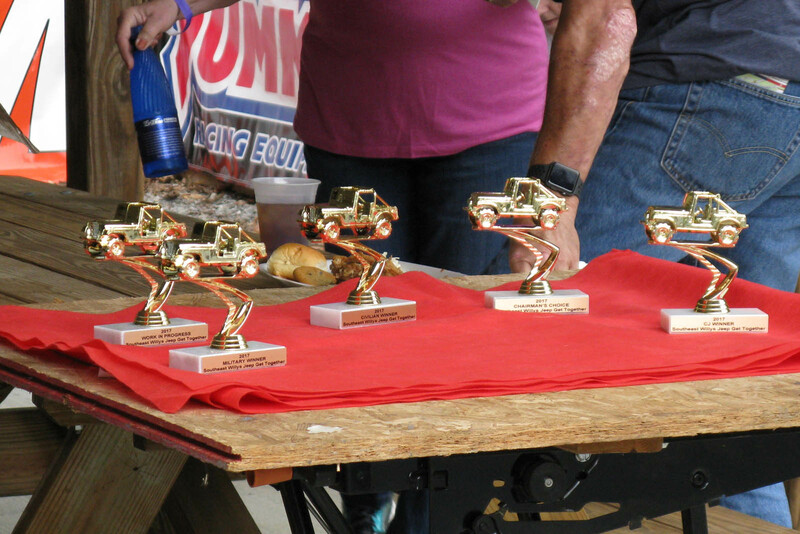 Well, I won a trophy for being selected to the top 25 in the first antique car show I entered. 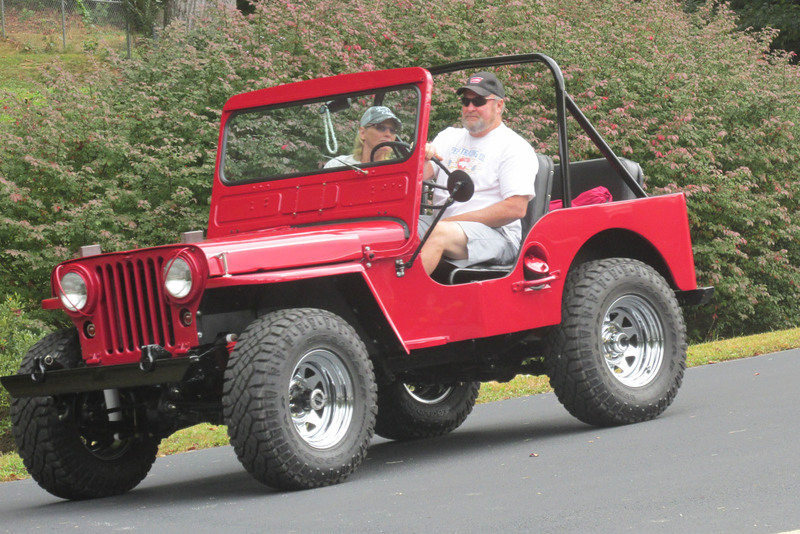 That was 17 years ago and Tiger has not missed a show since." 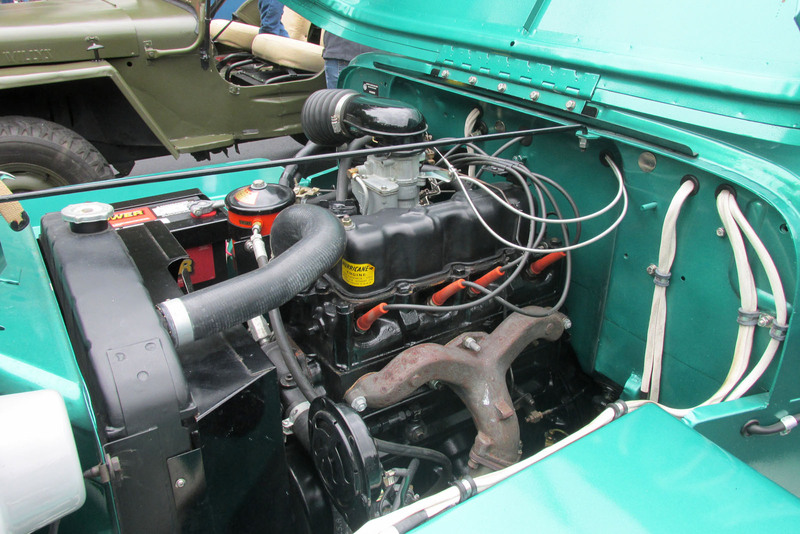 Also a look under the hood at Joe's Hurricane, which is very neatly done. 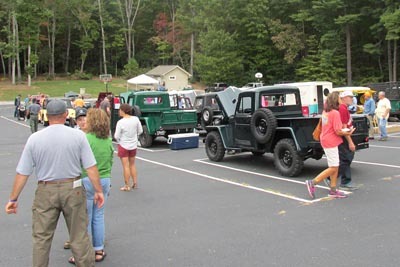 By the time everybody arrived, there were over 30 Jeeps on hand for the one-day event, and after a light shower early in the morning there was sunshine for the rest of the day. 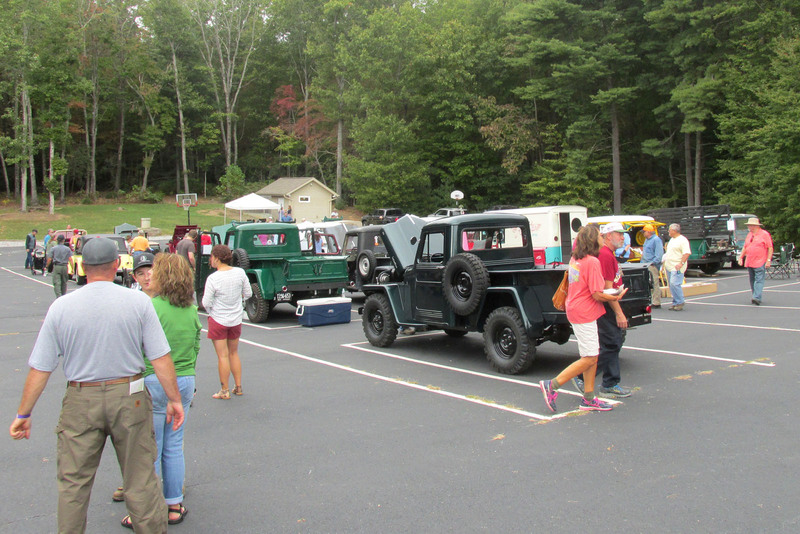 Visitors also enjoyed great food (fried chicken and BBQ) and period music. 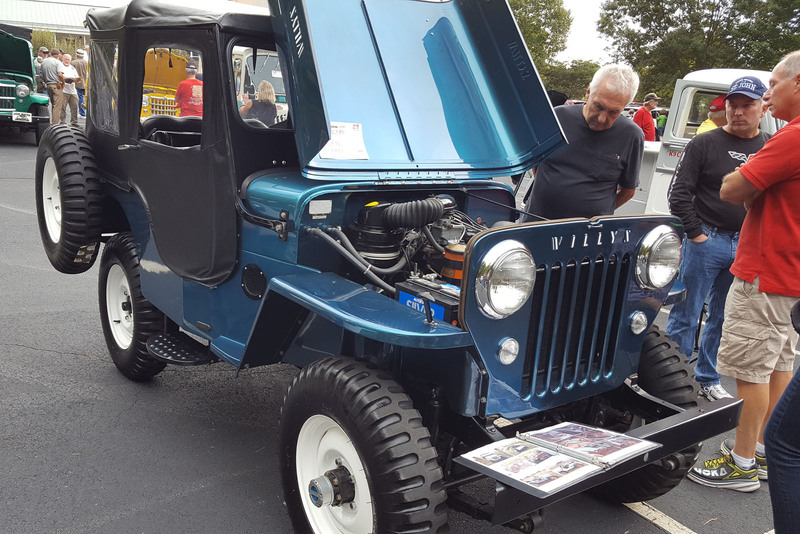 This '53 CJ-3B came to the show from Hendersonville, just a few miles down the road from Mills River, but owner Andrew Rhodes had lots of supplies in a carrier on top of the hardtop. 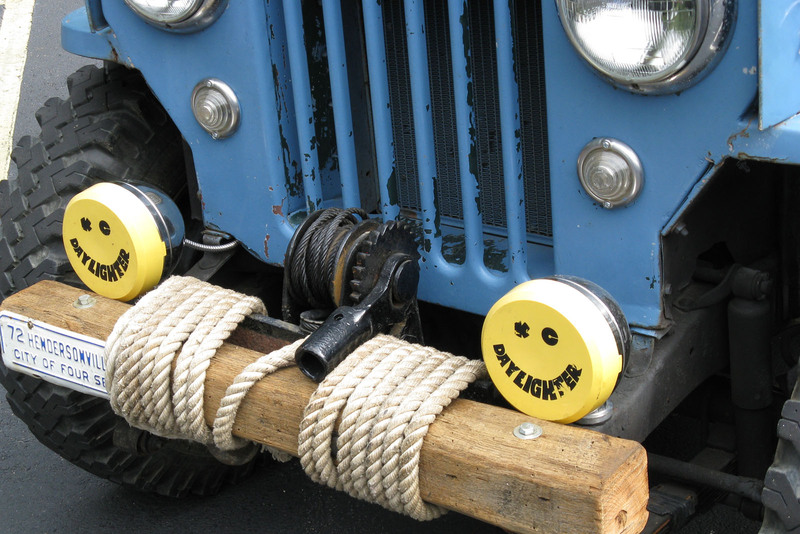 His front end (310K JPEG) was also fully loaded, with a winch, offroad lighting and a custom wooden bumper. The nice vintage custom touches continued in the 53's interior. 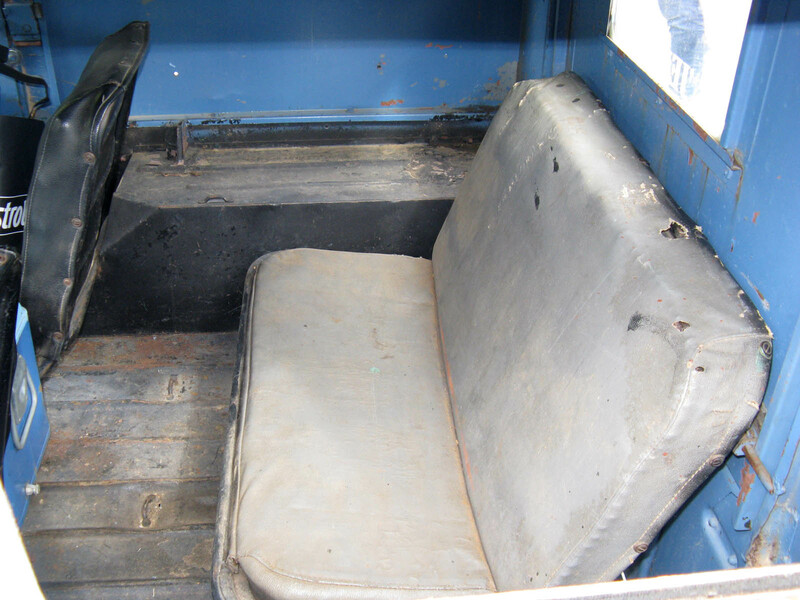 Andrew also has a rear seat in pretty decent shape (200K JPEG). 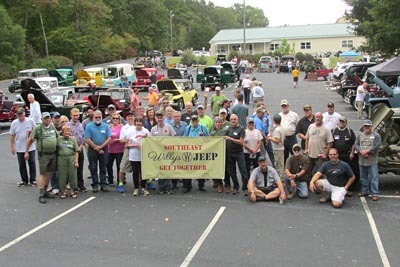 Joe Childers is near the right in his "CJ-3B" T-shirt in this great group photo, with the lot full of Jeeps spread out behind. 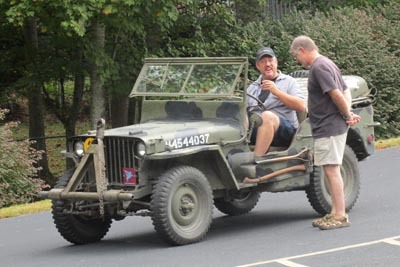 Lawrence and Ora Lee are on the left, in their "Jeep Thing" T-shirts. 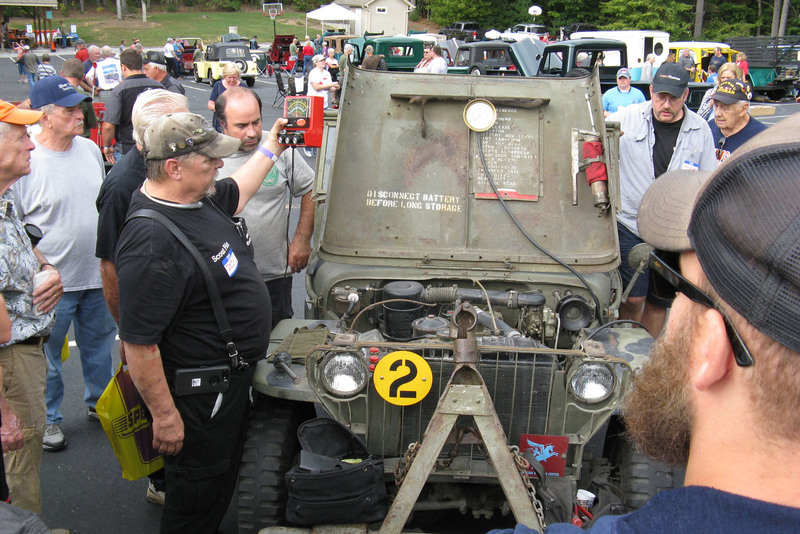 Southeast Willys organizer Will Springer is in the middle with the red logo on his shirt. 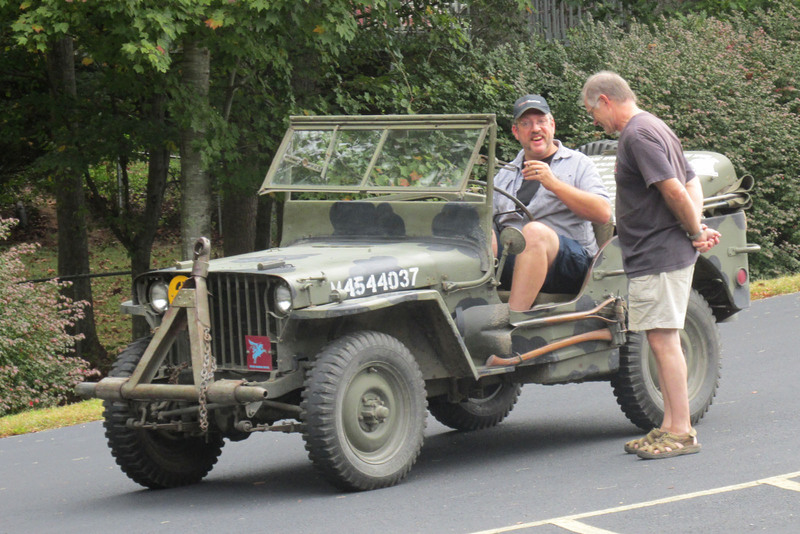 Behind him, in the middle, is Jeep historian and CJ3B.info contributor Harold West. 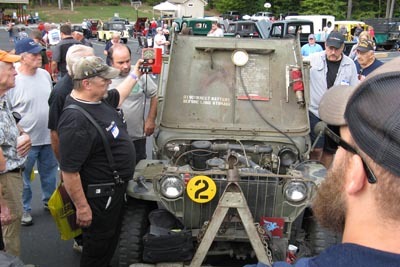 And behind Harold, in the blue T-shirt, is Rus Curtis, who documented Lawrence's Jeep with detail photos years ago for CJ3B.info (see 1955 CJ-3B Details). 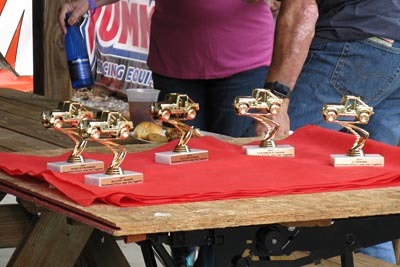 A bunch of trophies were up for grabs at the show, in categories including military, civilian, CJ, work in progress, and chairman's choice. 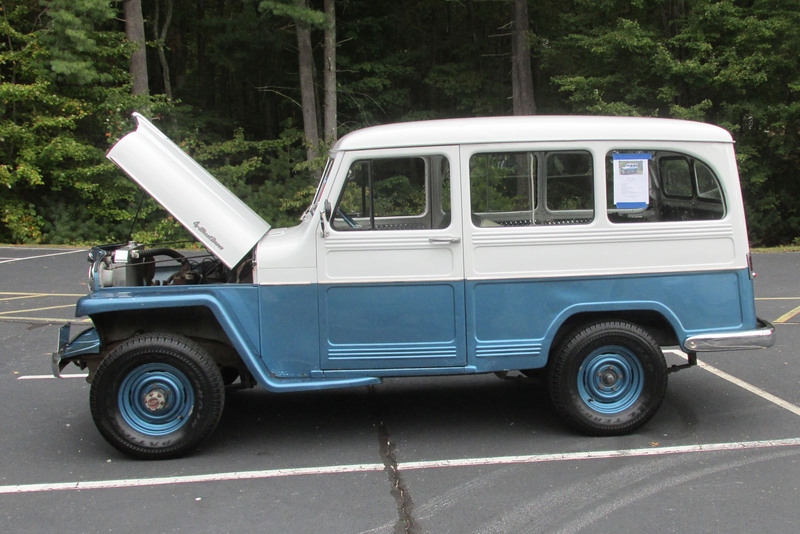 As it happens, the winner in the CJ category was the fourth CJ-3B on hand, a very nice '63 belonging to Allen Hinkel. The Jeep and its beautiful paint job got lots of close examination. 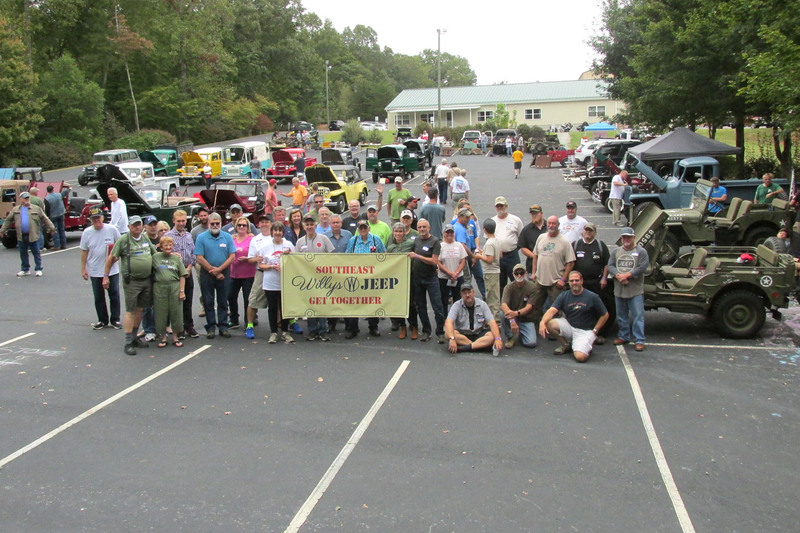 Allen is doing his part to raise high hood awareness in North Carolina with his "CJ3B" plate! The state is not exactly known for cold or rainy weather, but this Jeep is well equipped to handle whatever comes along, with its factory fresh-air heater and defroster, and dual vacuum-powered wipers. 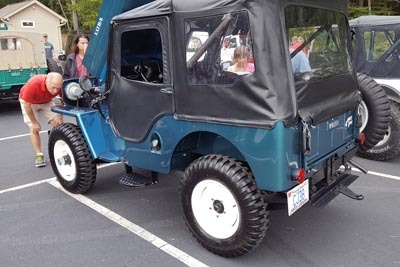 Speaking of cold, wet weather, Merlin Hanson of Hanson Mechanical in Maryland was rested up from the Alaska or Rust caravan, and he brought his 1942 slat-grille MB to the show. 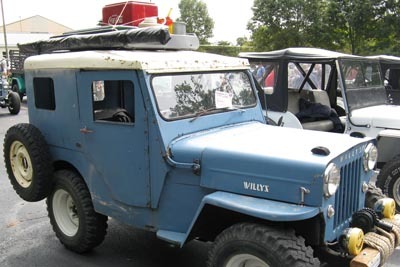 He also gave a slide presentation on the Alaska trip, and mentioned meeting Hugo Vidal of Operation Pineapple. The slat-grille was the guinea pig for a clinic by Rick "Scout Pilot" Pacholski of Old Jeep Carbs. The topic was how to tune an engine using a vacuum gauge, without the use of a timing light. For those looking to buy or trade parts, there was a good turnout of vendors. 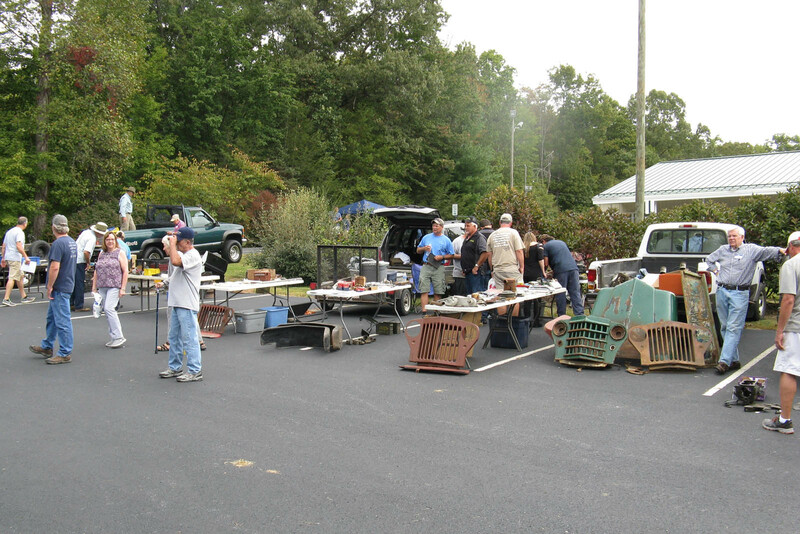 This is about half of the tables set up along the top of the parking lot. 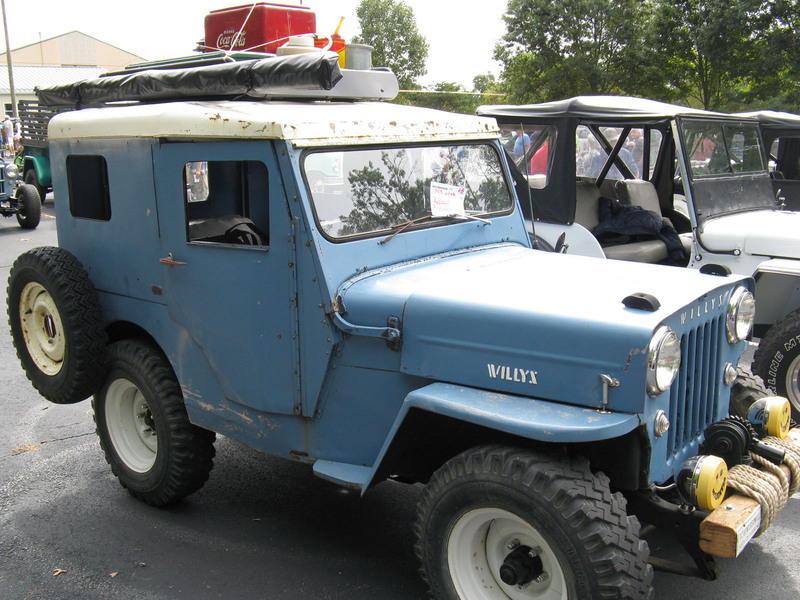 Something you don't see at every Willys event is a Fleetvan (see The Forgotten Jeep on CJ3B.info.) This FJ-3 was restored on the reality TV show FantomWorks for Valerie and Ron Patton of Asheville NC. 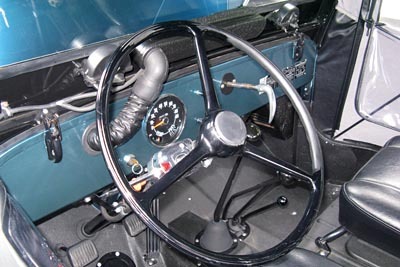 See the interior (180K JPEG). 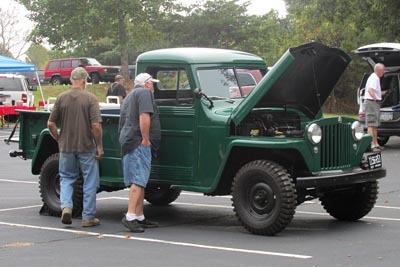 The green 1960 pickup is owned by Chuck Yoder from Virginia. And there were several beautiful Jeepsters on hand. This one belongs to Jim Nash. Bryan LeVan, who's in Kentucky, summed the event up on the CJ-3B Bulletin Board: "I had a great time at the Get Together. 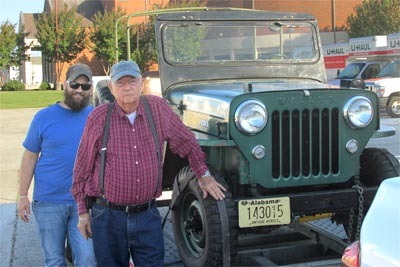 Met Rus and had a good long conversation with Lawrence. 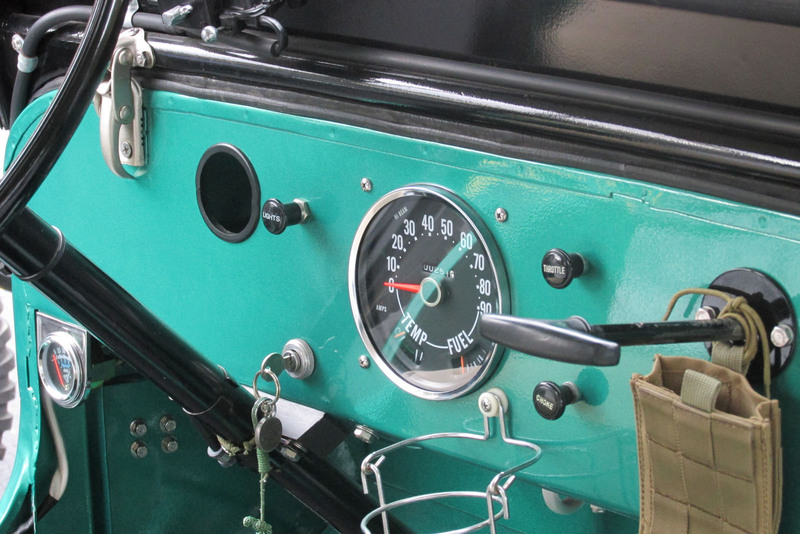 Spent a little time looking over Scout Pilot's shoulder as he tuned a Jeep but didn't get a chance to meet him. 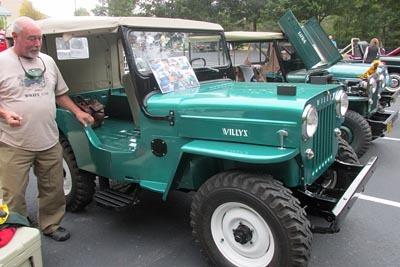 I'm looking forward to bringing mine to next year's event, although its not near as pretty as some of the Willys out there. 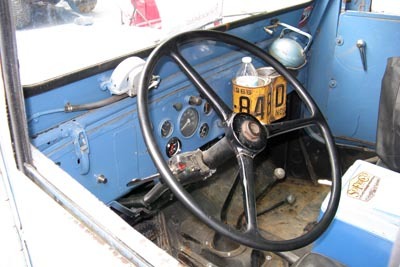 I'm glad the rain held off until Sunday, although it made for a miserable ride home."